New pre-print article at BioRxiv, Genomics of Mesolithic Scandinavia reveal colonization routes and high-latitude adaptation, by Günther et al. (2017), from the Uppsala University (group led by Mattias Jakobsson). Scandinavia was one of the last geographic areas in Europe to become habitable for humans after the last glaciation. 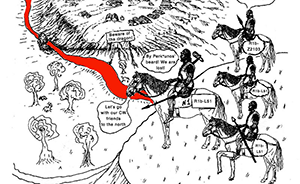 However, the origin(s) of the first colonizers and their migration routes remain unclear. 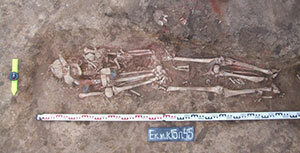 We sequenced the genomes, up to 57x coverage, of seven hunter-gatherers excavated across Scandinavia and dated to 9,500-6,000 years before present. 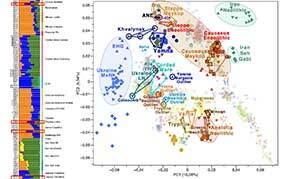 Surprisingly, among the Scandinavian Mesolithic individuals, the genetic data display an east-west genetic gradient that opposes the pattern seen in other parts of Mesolithic Europe. This result suggests that Scandinavia was initially colonized following two different routes: one from the south, the other from the northeast. The latter followed the ice-free Norwegian north Atlantic coast, along which novel and advanced pressure-blade stone-tool techniques may have spread. These two groups met and mixed in Scandinavia, creating a genetically diverse population, which shows patterns of genetic adaptation to high latitude environments. 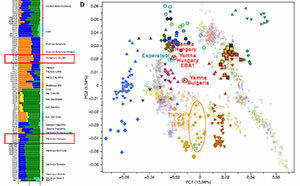 These adaptations include high frequencies of low pigmentation variants and a gene-region associated with physical performance, which shows strong continuity into modern-day northern Europeans. Finally, we were able to compute a 3D facial reconstruction of a Mesolithic woman from her high-coverage genome, giving a glimpse into an individual’s physical appearance in the Mesolithic. 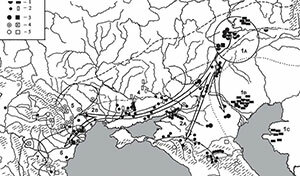 To investigate the postglacial colonization of Scandinavia, we explored four hypothetical migration routes (primarily based on natural geography) linked to WHGs and EHGs, respectively (Supplementary Information 11); a) a migration of WHGs from the south, b) a migration of EHGs from the east across the Baltic Sea, c) a migration of EHGs from the east and along the north-Atlantic coast, d) a migration of EHGs from the east and south of the Baltic Sea, and combinations of these four migration routes. The SHGs from northern and western Scandinavia show a distinct and significantly stronger affinity to the EHGs compared to the central and eastern SHGs (Fig. 1). Conversely, the SHGs from eastern and central Scandinavia were genetically more similar to WHGs compared to the northern and western SHGs (Fig. 1). Using a model-based approach (15, 16), the EHG genetic component of northern and western SHGs was estimated to 55% on average (43-67%) and significantly different (Wilcoxon test, p=0.014) from the average 35% (22-44%) in eastern and south-central SHGs. 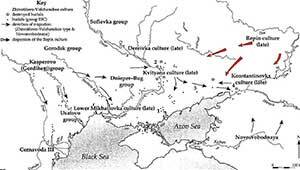 This average is similar to eastern Baltic hunter-gatherers from Latvia (28) (average 33%, Fig. 1A, Supplementary Information 6). These patterns of genetic affinity within SHGs are in direct contrast to the expectation based on geographic proximity with EHGs and WHGs and do not correlate with age of the sample. Combining these isotopic results with the patterns of genetic variation, we suggest an initial colonization from the south, likely by WHGs. 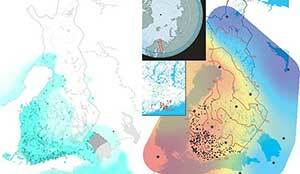 A second migration of people who were related to the EHGs – that brought the new pressure blade technique to Scandinavia and that utilized the rich Atlantic coastal marine resources –entered from the northeast moving southwards along the ice-free Atlantic coast where they encountered WHG groups. The admixture between the two colonizing groups created the observed pattern of a substantial EHG component in the northern and the western SHGs, contrary to the higher levels of WHG genetic component in eastern and central SHGs (Fig. 1, Supplementary Information 11). 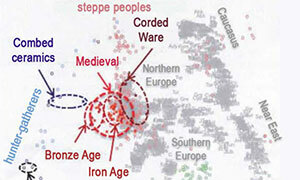 From the same article, three samples with reported Y-DNA, the three of haplogroup I2 (one more specifically I2a1b). Regarding mtDNA, four samples U5a1 (two of them U5a1d), two samples U4a1, one U4a2. 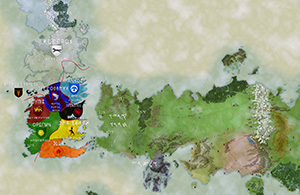 Featured image: potential migration routes, taken from the supplementary material. 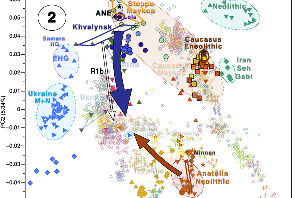 From the Indo-European diffusion model, you can read the sections on Late Palaeolithic and Early Mesolithic, and on Mesolithic and Early Neolithic expansion, as well as the section on Germanic.